. Published on July 8, 2014 . 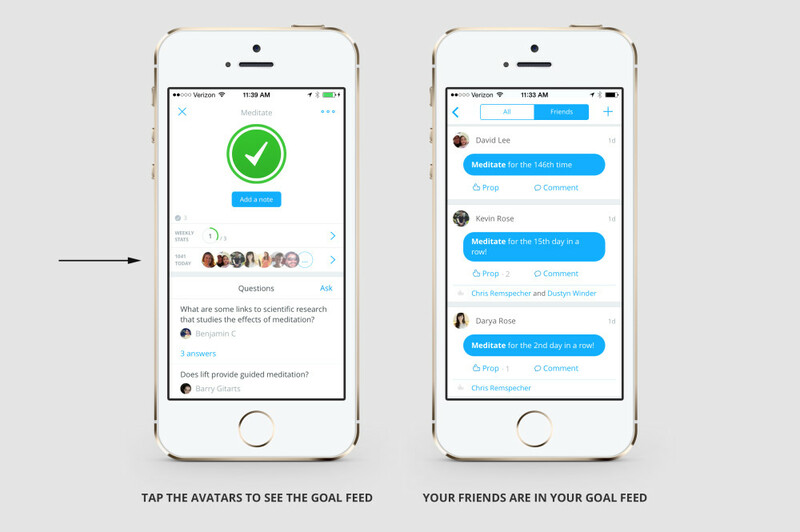 We’ve added your Q&A activity to your profile and a friend feed within each goal (tap check-ins today). Below is a story about the ambitions behind recent changes. In the Lift 1.0 era (i.e. last year), we had three communities: data-oriented self-trackers, pragmatic goal seekers who needed a tiny boost of accountability, and ultra-generous proppers who bonded over shared experiences. That was actually a really nice, niche app. And, for that reason, I think we caught everyone off guard by blowing it up. Community and data visualizations features disappeared for a few months (they’re both back now, and in the ballpark of what we hoped they’d become). I still get emails from a passionate part of the Lift 1.0 community about features they miss. The alarm that they feel to have a life changing feature disappear is real—their life stops changing! At first, I thought these features would only be gone for a moment. But they actually took months to rebuild (especially community). As a product designer, I wish I could promise you genius, but most days all I have to offer is persistence. That said, we’re past the rough spot, especially on the community side. Q&A is real and huge. Goal feeds are back. Today, we’ve also added goal-specific friend feeds. This is a community support system that can work wonders for your goals. In another respect, any change was going to be surprising to the Lift community. I’ve written 37 release notes to describe feature changes, but I’ve never talked openly about our ambitions. Of course we were going to change—we just weren’t saying that. By definition, a startup is an ambitious company. You can count on a startup making radical changes until two conditions are met: massive growth and massive profitability. But I think it’s easier to understand that we’re a startup because we were founded by ambitious people (i.e. the changes come from our choices not our situation). My story, which I’m not presenting as machismo or for sympathy, is that I walked away from a profitable small business (just basically shuttered it) and moved 3,000 miles from my partner (Sarah) and home (NYC), because I saw an opportunity in human potential. And don’t worry, the work is a joy, Sarah visits often, and our dog, Eggs, keeps me company when she isn’t here. I just want to demonstrate that Lift is a personal bet that wasn’t made casually. Why make that bet? We have an opportunity to redefine human potential. The person who made this bet possible, is my first partner, investor, co-designer and board member, Evan Williams. Ev is one of the three Twitter co-founders and Lift is the first product he worked on after Twitter. With Ev involved, are we trying to outdo Twitter? That’s a lifetime of work, and the amount that we’re going to get done in a day always feels inadequate. But we’re going to try. With that background, let me re-present the pieces of Lift 2.0 as a path that’s worthy of our ambition to redefine human potential. If Lift 1.0 was a habit tracker, Lift 2.0 is an instant coaching system for building super humans. Tracking, you know, is the base of holding ourselves accountable. The Lift tracking system is about universality—any goal can be framed in terms of doing routine practice. Shared goals create ubiquitous human support. We are each other’s cheerleaders. 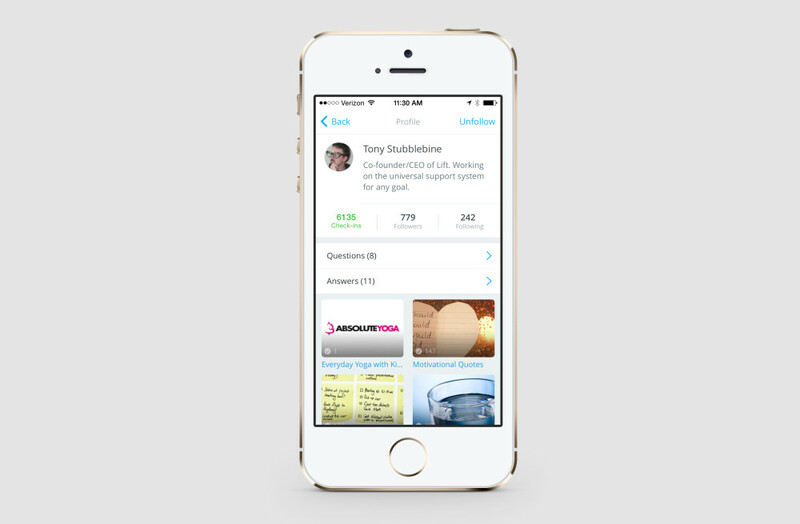 Q&A creates instant access to the shared knowledge of practitioners. 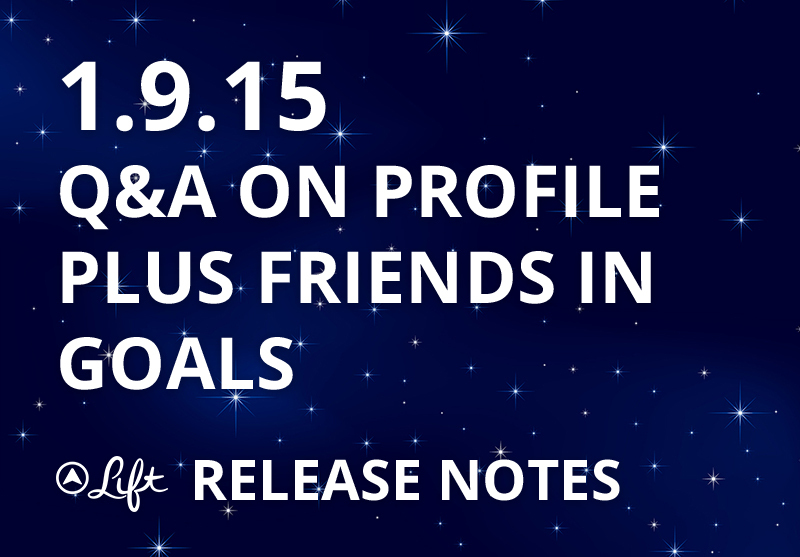 We have 200k active goals and nearly every question that’s been asked has been answered. This knowledge base that you’re creating is permanent and serves even non-Lift users (thanks to Google). All of us will be carrying around the capability in our cell phone to get instant access to knowledge, accountability, and encouragement for any goal. That’s the path to becoming super human. PS: I left out one special piece because I ran into Apple’s word count limit. I’ll share our news in the next release note. PPS: Update your app store reviews please.